Acclaim Foodservice is highly focused agency serving the Southern California Marketplace. We are a growing entity in the Foodservice arena in Southern California. Founded 7 years ago at the request of a large national client we have grown to represent several well-known brands and are developing a reputation as a highly professional and responsive agency. We have been part of the IBA for over a year now and benefit from the sharing of clients and ideas to innovate and service the client’s needs. Southern California has a diverse population and many distributors in the market. We call on all the distributors and work closely with their sales team to make them your sales team. We participate in shows and trainings to generate the leads and create excitement about your products. We call on multi-unit chains, hospitality, and retail foodservice, colleges and universities as well as high volume single unit operators. We work with the chefs to develop menu options for your products and sell the features and benefits of your items. We are finalizing our participation with Foodservice Enablers to have a state of the art Customer Relationship Management system. 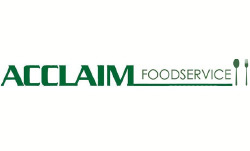 Acclaim Marketing & Sales provides high caliber Food Brokerage representation in the California market place. The expertise and success of Acclaim Marketing & Sales represents nearly 30 years of providing its principals and clients with an aggressive, goal oriented approach to sales and marketing. The company stands poised to provide the full range of services necessary for successful sales execution.